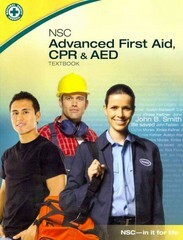 NSC Advanced First Aid, CPR & AED 1 Edition Part of a series of titles authored by the National Safety Council, First Aid: Taking Action covers the material required for a semester long Advanced First Aid course . The focus is teaching how to recognize and act in any emergency and to sustain life until professional help can arrive. Other information includes bleeding control, and first aid for sudden illnesses and injuries. Information is presented in a concise easy-to-read manner that works as a handy reference after the course. National Safety Council programs and products are designed to benefit all types of learning styles by combining lectures, video presentations, group discussions, and hands-on training.